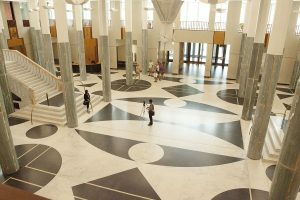 Canberra is home to some gorgeous mosaics, including at the Australian War Memorial where we will have a private guide to tell us about two exceptional mosaics: Napier-Waller’s (Australia’s first home grown mosaicist) extraordinary work in the Hall of Memory and the Shellal mosaic discovered during the 2nd battle of Gaza in 1917. Created in AD 561 – 562 under the reign of the Eastern Roman Emperor Justinian, the mosaic is now on permanent display in the Hall of Valour. Other sites we visit include mosaics by Margo Lewers, an Australian interdisciplinary abstract artist who worked across the media of painting, sculpture, tapestry, ceramics and the domestic arts, and also Leonard French, who was a major glass artist. We will stop in for lunch at the popular venue ‘The Dock’ on the Kingston Foreshore (at own cost), which showcases MAANZ member Caitlin Hepworth’s recent major mosaic installation.